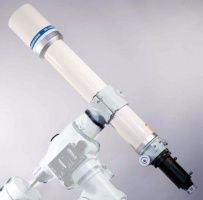 Like the FS series, the FC series are apochromatic refractors with two-element fluorite lenses. The FC series have larger apertures and longer focal lengths than the FS series, and provide outstanding performance both for the visual observer and the digital imager. The FC-100DL is the latest addition to the FC range of lightweight Fluorite Apochromatic Takahashi telescopes.